Manchester United's interim manager Ole Gunnar Solskjaer says his contract with former club Molde has expired. 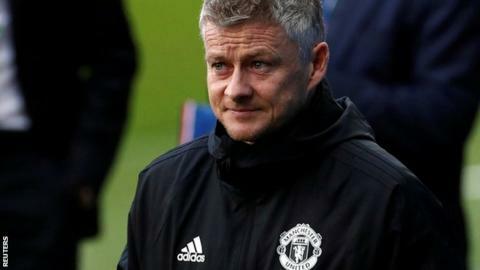 Norwegian side Molde announced on 3 December, two weeks before Solskjaer replaced Jose Mourinho at United, that he had agreed a new three-year deal. However, that story has now been removed from the club's website. Talking about a potential return to Molde, Solskjaer told Norwegian media on Monday: "I think I would have to sign a new contract there." Molde's 2018 season had finished by the time Solskjaer departed. The new campaign starts at the end of March. The Norwegian club stressed at the time they were only "lending" Solskjaer to United, indicating they expected him to return. United's statement announcing Solskjaer's arrival as caretaker manager made no mention of whether or not he would return to Molde when the Premier League season ends. The former striker has been linked with the job long-term after impressive results at Old Trafford. Norwegian journalist Arilas Berg Ould-Saada told BBC Radio 5 Live: "Firstly we thought he was on loan, so basically that his Molde contract was still running for three years but was frozen and he would go back to Molde in the summer. "Now, maybe United just paid him out of the contract in order to be sure that they don't need to pay any more money if they want him as the permanent manager. "If those are the technicalities then United don't need to pay any compensation at all." The interesting thing is Solskjaer's contractual situation with Molde is a near irrelevance when it comes to his position at United. Should the club pay up the three-year deal he agreed with Molde on 3 December, it would come to around £1.5m. Safe to say that is some way below the figure it would cost to get Mauricio Pochettino from Tottenham. Far more noteworthy is United's decision to use Solskjaer as the face of their season ticket sales pitch for 2019-20. And who's deciding what's happening during pre-season, as well as making decisions on transfers and new contracts? The answer is Solskjaer. The smart money is on him never returning to Molde.